Rheem produces a complete line of quality heating equipment for you to choose from in selecting the unit that will best meet your needs. For instance, the Criterion II comes in Upflow, Downflow, & Horizontal models to accommodate almost any installation requirement. 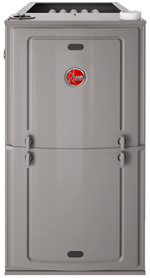 Rheem also offers a full range of heating capacities to meet your different heating requirements. 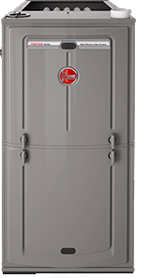 Beyond that, Rheem also offers a full range of premium models such as the Criterion II LSE, Critirion II Plus 2, & Classis 90 Plus gas furnace lines. Riccar Heating & Air Conditioning: Your partner in selection & service. 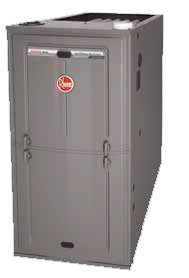 With Upflow, Downflow, & Horizontal models - not to mention BTUH capacities ranging from 45,000 to 150,000 - We don't expect you to know which Rheem Criterion gas furnace is best for you. There are a lot of factors to consider in making the right choice. These include how large your house is, how it is constructed, how much you want to invest in a heating system---even your "comfort" requirements (how warm you like to keep your home). That's where Riccar Heating & Air Conditioning comes in. They are trained to do a complete analysis of your needs, make recommendations, & provide you with a detailed estimate--all in easy-to-understand terms. Above all, Rheem wants you to know two things. First, Riccar Heating & Air Conditioning is a trained professional that you can trust & have complete confidence in. And second, no company is more dedicated than Riccar when it comes to providing you the maximum value for your home heating investment.